Decorate your new home away from home with these interior design tips and tricks. Entering a stark white room with minimal furniture and nothing that feels like home can be disconcerting. But with these pointers, you’ll have an apartment or residence hall that feels like home in no time. Adding potted plants or flowers on a desk or along a windowsill eliminates the stuffy atmosphere that surrounds most residence halls or small apartments. Boosting your mood and reducing airborne dust are a few of the benefits of indoor plants, the New York Times reported. Grab a succulent or cactus from Whole Foods for a low-maintenance solution to bring some life into your room. 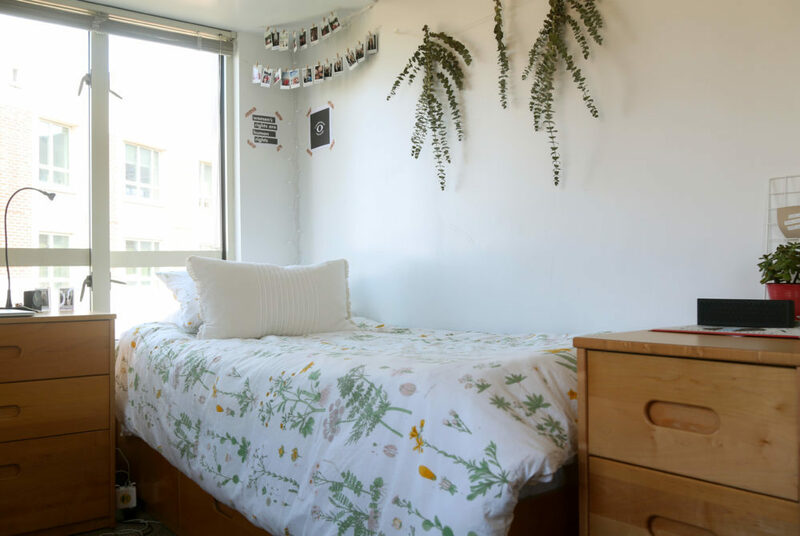 For freshmen, your bed will likely function as your couch, desk, dining table and Netflix binge spot. But even for upperclassmen, a cozy bed to return to every night may persuade you from skipping Gelman all-nighters. GW-issued mattresses are not comfortable as is, so use mattress pads, throw pillows and blankets to turn the hard sleeping spot into a cozy haven for afternoon naps. Added comfort can be purchased from places like Bed, Bath & Beyond, Target and even Amazon. The fluorescent light in residence halls can give off a cold, sterile vibe. Nix the switch and instead use lamps on your desk and around the room to give off warm lighting. For additional lighting and decoration, jazz up your walls and ceilings with twinkly Christmas lights. The dim lighting will help you relax and destress after a long day, and the added lighting can be purchased online through Amazon or even right on campus at CVS. Tacking up a huge poster can be an easy way to fill white walls, but investing in a hanging calendar will be more useful in the long run. A decorative traditional wall calendar is a good compromise between a poster and a calendar, but a dry-erase calendar can track your daily and weekly activities to help you stay organized. Calendars and other office supplies can be purchased at Staples on 19th and L streets, just a 10-minute walk from campus. Residence halls and apartments are small spaces, so packing huge decorations and filling the wall and countertops will be overwhelming and give the space a stressful feel. Instead, use small accents to spice up your space. Washi tape, a Japanese crafters tape that comes in various patterns and colors, is a good option to turn boring plain walls and shelves into quirky, colorful statement pieces. The tape can be found at Walmart, Target and Michaels, and can be used to hang art posters, pictures with friends or used as an accent along the edges of your desk.